Oh! Giant of Afrika: Biafra the land of the rising sun. The land that flows with milk and honey. Obodo Chukwu Telu Mmanu. The pride of black race, Oh! Great people. Why have thou forsaken your people. Your people are dying every day in the high sea for seeking a greener pasture in the foreign land because the foreigner has installed dictators in the country to kill them when they come out to speak against injustice.. No one to cater for their wellbeing. Children of light, (umuchineke). The pride of black and the hope of humanity. Freedom is all we ask. Freedom! Freedom!! Freedom!!! For the black race. Oh! Giant of great race. Your downfall is our downfall. Why have thou over looked us for centuries? They enemies we call our friends are supplying weapons of war to kill us your strings. Where is your crown? Where is the love for your people being? Why are you running out from mother Afrika? Afrikaans can’t you see that enemies have turned our brothers against us. Our leaders are killing us unlawfully and unjustly jailing us for speaking out loud. Our so called leaders and religious leaders are criminals and looters who are milking us dry. Also taking the loots to their slave masters evil British government and his collaborators. Oh! Giant of Afrika, the epicenter of creations. The land that flows with milk and honey. Where is your crown? When shall thou restore the lost glory of mother Afrika? Is their hope for Afro- Americans who are been slaughtered on daily basis? Is there hope for Japan of Afrika? Oh! Giant of Afrika: we love and cherish. We hope you restore our dignity back because In Biafra we (Africans’) died. We await your restoration as soon as possible for our unity to be strong. The enemies have sowed a seed of hatred among our people. The Divide and Rule has been working for them for centuries. The enemies said Biafra is our problem because the enemies knew you are our pride and hope for mother Africa. The Japan of Afrika. Biafrans arise and take your place and restore our motherland back. Our elders are mute, because they have sold conscience to the crumbs that fell from their masters table... The learned once has being studying white supremacy for centuries. Biafra you are the founding fathers of civilization. The architect of designs. Why sit and watch us die for nothing? When we have the mineral resources that can improve our standard of living. Arise oh! Giant of Afrika. The kingdom long awaited is here with us Biafra the land of the rising Sun. The leader of the indigenous people of Biafra has been unlawfully detained for asking for your betterment and good standard of living. Mazi Nnamdi Kanu Ohamadike the director of the most powerful Ogbunigwe (Monster Bomb) radio station Radio Biafra / Biafra Television (TV) has been calling from the wilderness for your emancipation for a better life. Why have you forsaken him to die slowly in prison for asking his right and yours? Has he wrong you for seeking and asking for your betterment? Do you have a better life? How about the source of water you drink? Do you have electricity in your various homes? Why have you chosen darkness over light? Why have you chosen poverty over riches? Lots more to answer for yourselves. Biafra the beacon of hope of black race, Rise up and pick up your various crowns and Rule your people. Biafra Bu Obodo Chukwu Okike Abiama Telu Mmanu. You are the beacon of hope and pillar of progress in our lives. Oh! Rise up black people. Rise up great people; rise up the children of light. 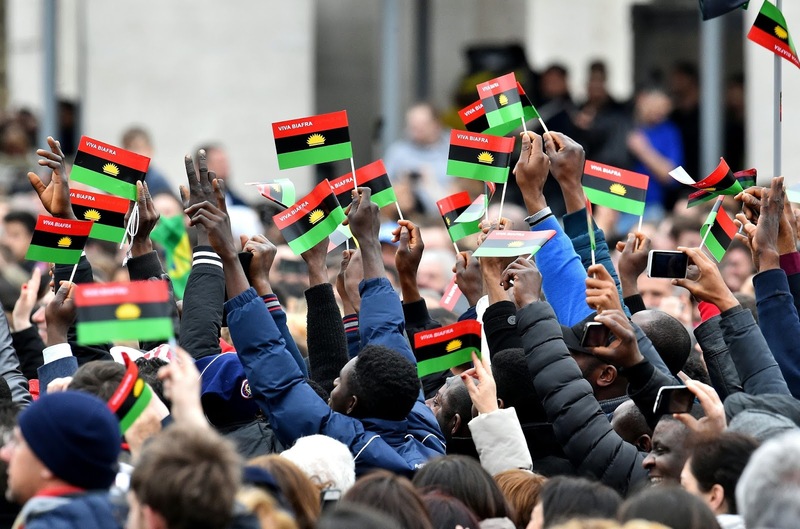 Chukwu Okike Abiama ga gozie unu umu-Biafra. We shall take our place because this time around is either they give us the blessed nation of Biafra or we die getting it. Enough of this injustice in mother Afrika. Suffering and smiling must stop. The most high has blessed us with embedded talents, wisdom, knowledge and understanding. We shall stand with one voice to take forcefully on what belongs to us. Oh! Giant of Afrika (Biafra). Biafrans the destiny is in your hand. Take it now and make a better life or die in poverty. The choice is yours to make. Fight! Fight!! Oh! Great people of Biafra your time has come. Biafra your children most have a brighter future. Because if you don’t do the needful now the next generations will suffer bitterly and the blame will be on you. Stand up and take your crowns oh! Giant of Afrika (Biafra).